MUJER. Imagen por AMILCAR MORETTI. 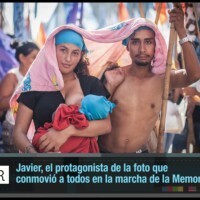 MICAELA, CELESTE Y JAVIER, EN UNA IMAGEN DEL VIERNES 24 QUE CONFIRMA LA TRANSMISIÓN CULTURAL DE UN PUEBLO QUE TIENE UNA BUENA PARTE DE SALUD. De Sara Facio a M.A.F.I.A.